Big Bins, Skip Bins, Mini Skips – What’s the difference? There is many different shapes and sizes of skip bins called by many different names, so we’ll try to unravel and explain the types of bins we supply. Skip bins, Mini Skips and Mini Bins are pretty much all the same. They are a steel bin designed and constructed for repeated rentals. 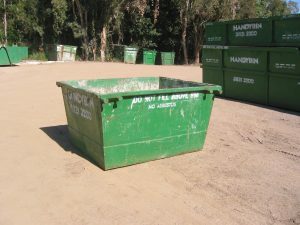 The name for this type of bin is a Marrell bin or sometimes a ‘Lift on, Lift off’ bin. They lift on and off trucks with a Marrell lifter using chains. The larger Hook bins are called RORO bins or Roll on, Roll off bins. They load on and off the truck using a ‘Hook Lift’. The hook on the lifting gear hooks under a bar in the A-Frame at the front of the bin. The bin is then lifted as the truck rolls under the bin onto the truck frame and locked into place. The Handybins are the most popular of our skip bins. Our range of sizes is one of the most complete in Brisbane. Handybins are available in 2, 3, 4, 5, 6, 7, 8, & 9 cubic metres. 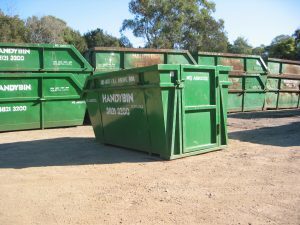 With such a broad range we know that we will find the right bin size to match your job. If you need a larger bin, you can also book one of our BIG BINS (12, 15, 20, 25 & 30 cubic metres). Door Bins – What a difference a door makes! We were one of the first companies in Brisbane to introduce door access on a broader range of bin sizes, in particular, the Handybin range of ‘lift-on, lift-off’ bins. The design means that no ramp is used to access the bin, making loading easier. Wheelbarrow doors are available on all 6m, 7m 8m & 9m bins and some 4m & 5m bins. The door is 750 mm wide and will accommodate a large tradesman’s wheelbarrow. Our proven design means that no ramp is needed to access the bin, providing a safe and efficient way to load your rubbish. 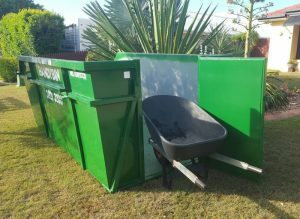 Our Big Bin Hook-lift bins offer an alternative to Marrell skip bins. These bins are ideal for large volumes of waste. 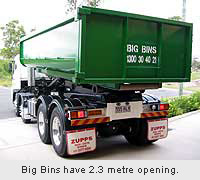 Our range of ‘BIG BINS’ come in 12m³, 15m³, 20m³, 25m³ & 30m³ capacity Bins. 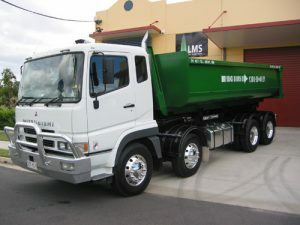 They are a Roll On-Roll Off style bin that has a rear opening tailgate which is 2.3 metres wide. 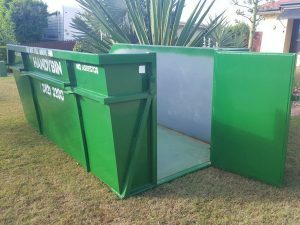 These bins are suited to commercial & industrial situations, larger building, construction and demolition sites or for bulk factory/business cleanups. They are used for large, cleanups around homes, clubs, schools, factories etc. Our ‘Bin Sizes & Prices‘ and ‘Waste Types‘ pages offer great information on bin sizes, prices, dimensions and capacity of our skip bin if you want to find out more about using skip bins for removing rubbish.